The future has always been hard to predict, but as technology evolves ever more quickly, it can now be just as hard to imagine. 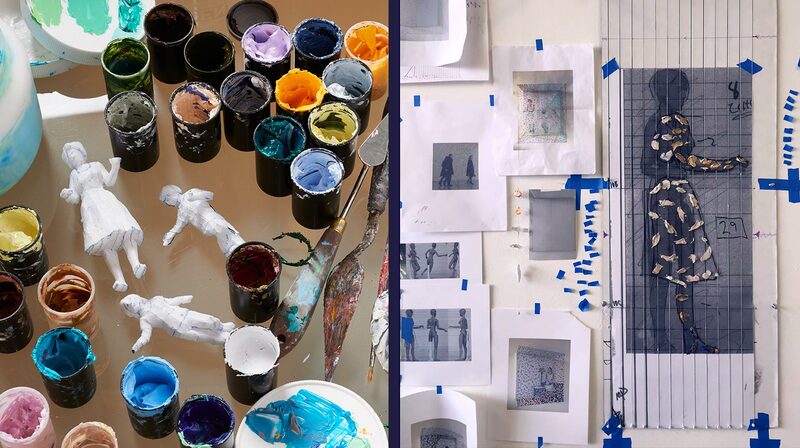 To understand the next wave of innovations—such as nanotechnology in our bodies, computers that can see like humans, and the Internet of Things in the age of scarcity—Qualcomm collaborated with Atlantic Re:think, The Atlantic’s creative marketing group, to explore the emerging edge of technology through art. The next stage of the digital revolution, which is transforming everything from homes and cars to heavy industry and national defense, brings with it the need for a quantum leap in connectivity. The enormous increase in data and real-time analytics required, especially for the automation of critical tasks, calls for a new standard in the speed, reliability, and security of mobile networks. Enter 5G. Experts predict that devices in the tens of billions will be connected to the Internet of Things by the end of this decade. For that and other reasons, the new 5G network will be coming online just in time. Fighting wildfires in the U.S. last year cost a record $1.7 billion and seven lives. Over the last 10 years, those figures have averaged $1.1 billion and 18 lives, according to the U.S. Forest Service, which is expecting longer and hotter fire seasons as global climate change intensifies. But what if something could be done about that? What if in five or 10 years the acreage lost to wildfires could drop to the lowest level since records were first kept in 1960? The U.S. last year lost an area equal to Massachusetts and Connecticut combined. What if the loss could be reduced to the size of, say, Rhode Island? Or Central Park? Technology expected to emerge within three or four years may do just that. It won’t be easy. It will take thousands, if not millions, of wireless sensors planted in forests that can send out alerts when fires first spark. Those low-cost sensors will need to communicate reliably back to the network through cell towers, ground equipment, and even other devices, operating on batteries that can last for more than 10 years. 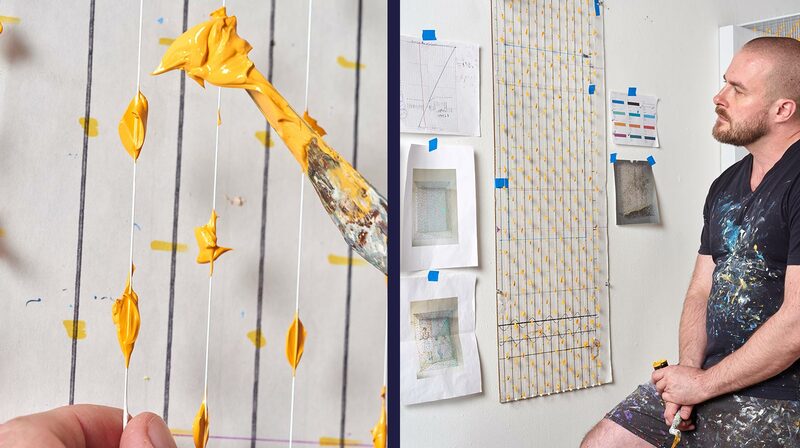 Chris Dorosz, a Canadian artist, tries to visualize and understand what we can’t see. But most of all, they will need a new kind of mobile network with advanced wireless technologies that can go far beyond delivering internet service to smartphones. They will need the 5G network, successor to 3G and 4G—a network that promises to do a great deal more than prevent forest fires. The range of use cases for 5G could not be wider. Yes, it will let mobile users download a movie in seconds rather than minutes and provide never-buffering, mind-exploding virtual-reality experiences. But it will also play a role in agriculture and food production, connecting field sensors that will facilitate planting, fertilizing, and irrigating crops with optimal efficiency. It will help drive driverless cars, saving millions of lives and giving the elderly and disabled the ability to get out and around, visit loved ones, and do simple errands by themselves. It will provide such a seamless, reliable connection that doctors could even perform remote surgery using a 5G connection. And as the key underpinning for the much-heralded Internet of Things (IoT), 5G will eventually enable a communications network that connects just about everything to just about everything else: home thermostats to the electrical grid, vital signs from bloodstream bots to our doctors’ offices, supply chains to assembly lines, real-time diagnostics from an airliner malfunction to the nearest tower and maintenance hangar. Nobody will have to ditch old mobile phones and tablets, because 4G LTE will only get better as plans for 5G unfold around the world. And 5G is being designed to be interoperable with LTE so that early 5G’s early-adopters can continue to enjoy the ubiquitous coverage of LTE as 5G networks are deployed, using multimode LTE/5G devices. The early adopters will be even more impressed by 5G’s extremely fast exchange rate, or “low latency,” the opposite of which causes all the annoying lapses in content streamed over even the fastest 4G network, especially for real-time applications such as video calls. The exchange rate of 5G will be undetectable to humans. The goal is for it to drop to 1 millisecond: Hummingbirds need five milliseconds for one wing-flap. This real-time performance is being coupled with levels of both security and reliability (less than one out of 100 million packets lost) sufficient to support mission-critical services for which failure is not an option: navigating self-driving cars in fast and complex traffic, orchestrating a fleet of drones, even remote-controlling critical industrial or medical equipment. These new 5G capabilities will support an enormous range of new possibilities, including a major advance for robotics. Getting to this 5G future will not be easy, however. To achieve vastly greater data capacity and extreme connection speeds, for example, new 5G networks will utilize millimeter-wave frequencies above 20 gigahertz (today’s 4G networks primarily utilize frequencies below 3 gigahertz). That range in the radio spectrum has the bandwidth capacity to meet the extreme requirements of 5G, but the shorter wavelengths in that part of the spectrum present a challenge as well: Wireless signals in that range can’t travel as far as others and may be more easily obstructed by objects and people. 5G is addressing that problem with redundancy, using a massive number of antennas and multiple signals to increase their range and make sure that if one signal is blocked, another will get through. It has become such a ubiquitous aspect of everyday life that we often lose sight of the technologies that make connectivity work. Qualcomm is a leading force behind the out-of-sight grid that allows us to text, post, tweet, watch, and listen from our phones. They’re also behind the next generation of mobile networking. Building off its experience with previous wireless networks, Qualcomm is driving forward the 5G network as a member of the 3rd Generation Partnership Project (3GPP), a collective of telecommunications organizations collaborating on developing standards and testing technology for 5G. Its research on two key elements of it—the wireless air interface and the network architecture—will help make the 5G network a reality in just a few years. What on earth are those two things? The wireless air interface is the last leg of the journey that data takes when it’s sent or received: for example, the wireless connection between your smartphone and your mobile operator’s cell tower. The network architecture is the hardware, software, protocols, and other infrastructure that manages that connection and appropriately routes the data to the internet. Qualcomm has been working to design a 5G air interface that is capable not only of handling a vast increase in data but also of handling all types of data from all manner of devices. Our mobile phones are essentially two-way radios, but for them and all types of connected devices to communicate more efficiently and more reliably than our current network allows, Qualcomm is developing new wireless technologies that can meet an extreme variation of requirements. They’re also utilizing previously unexploited radio frequencies, where there’s plenty of unused space for huge and increasing amounts of data to travel faster than ever before. Qualcomm is already pioneering many of these new wireless technologies with the LTE network, making better use of unlicensed spectrum for faster speeds as well as optimizing LTE to support the vastly increased connectivity required by the Internet of Things. For the new network architecture, flexibility and scalability will be critical. Massive technologies like the Internet of Things must be energy-efficient in order to be practical. That’s why Qualcomm is helping to build a network architecture that scales to meet different requirements, able to serve local hotspots and reach across vast physical distances using the least amount of energy and bandwidth as possible. And as hardware increasingly gives way to software—think hard drives giving way to cloud storage—there’s an opportunity to create virtualized “network slices” for end-to-end connectivity that is optimized for every possible use case. Those use cases range from seamless virtual-reality experiences to fully-connected smart cities that comprehensively monitor energy usage, traffic, crime, and more. And though we might not be able to see or touch the network that will make it all possible, Qualcomm is helping create it. It’s become such a ubiquitous aspect of everyday life that we often lose sight of the actual technologies that enable it. Qualcomm is a leading force behind the out-of-sight grid that allows us to text, post, tweet, watch, and listen from our phones; they’re also behind the next generation of mobile networks—5G—that, by 2020, will put into place a tightly-woven, scalable wireless infrastructure that can handle everything we throw at it. Building off its experience with our current and former wireless networks, Qualcomm is driving forward the 5G network as a member of the 3rd Generation Partnership Project (3GPP), a collective of telecommunications organizations collaborating on developing standards and testing technology for 5G. Its research on two central elements of the new 5G network—the wireless air interface and the network architecture—will help make it a reality in just a few years. Qualcomm has been working to design a 5G air interface that is not only capable of handling a larger amount of data, but adaptable enough to handle different types of data from multiple kinds of devices. Our mobile phones are essentially two-way radios, but for them and all types of connected devices—from smart cars, to pacemakers, to sensors in smart cities—to communicate more efficiently and more reliably than our current network allows, Qualcomm is developing new wireless technologies that can meet an extreme variation of requirements. They’re also utilizing previously unexploited radio frequencies, where there’s plenty of unused space for more data to travel faster. Qualcomm is already pioneering many of these new wireless technologies with the LTE network, making better use of unlicensed spectrum for faster speeds as well as optimizing LTE to efficiently connect the Internet of Things. As for the new network architecture, flexibility and scalability will be key. Massive technologies like the Internet of Things must be energy-efficient in order to be practical. That’s why Qualcomm is helping to build a network architecture that scales to meet different requirements: Able to service vast physical distances as well as produce local hotspots, using the smallest amount of energy and bandwidth as possible. Those use cases range from seamless virtual reality experiences right from your phone to fully connected, communicative smart cities that comprehensively monitor energy usage, traffic, crime, and more. And though we might not be able to see or touch the network that will make it all possible, Qualcomm is helping create it. A hopeful sign for agreement on industry-wide standards came in March with the release of a 5G standard-in-progress for the new radio access technology (3GPP Release 14 Study Item), which is being provisionally adopted by major players. Ericsson and Qualcomm are already teaming up to develop and test the new technology. For example: Burying sensors underneath half-a-million square miles of national parks, almost 15 percent of the U.S., will require an army of technicians and forestry experts with the training and equipment to find optimal locations for them. Those sensors and the communications network connecting them will have to be designed in labs and assembled in factories to specifications and standards still unknown. Many major applications of 5G still have logistical obstacles to address. Like the preventive detection of forest fires, building out the 5G network will take years and an entirely new infrastructure. Developing the necessary networks, devices, and systems is going to cost a lot of time and money. But what will 5G save us, in the long run? Countless lives, by allowing smart cars to communicate instantaneously with their environment and each other, and by letting specialized doctors treat patients across the world. Countless energy resources, as it connects meters and sensors in homes to wind turbines and solar panels for optimal efficiency and minimal waste. Canadian artist Chris Dorosz offers a solution by lending as much weight to negative space as he does to the positive. 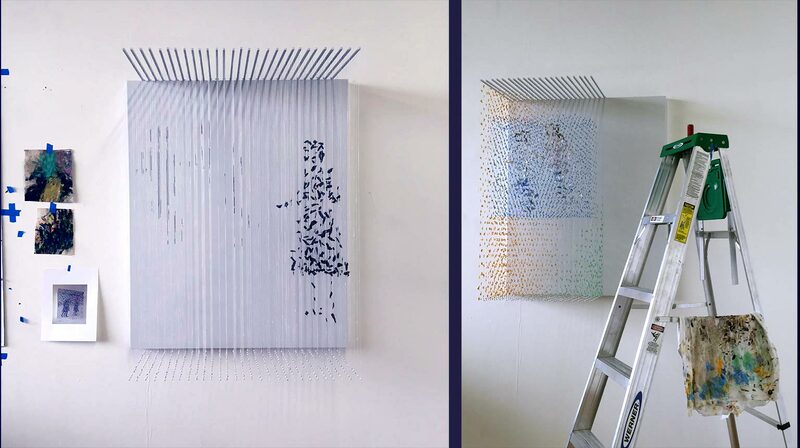 He’s known for his paint-drop sculptures—in which carefully curated drops of paint are allowed to move down and settle in clear, hanging plastic rods—that utilize gravity and space as tools. Dorosz' first step was to carve scale figures out of Styrofoam, which served as guides to the larger work he ultimately built. The specificity of the final human figures is a result of those initial templates. 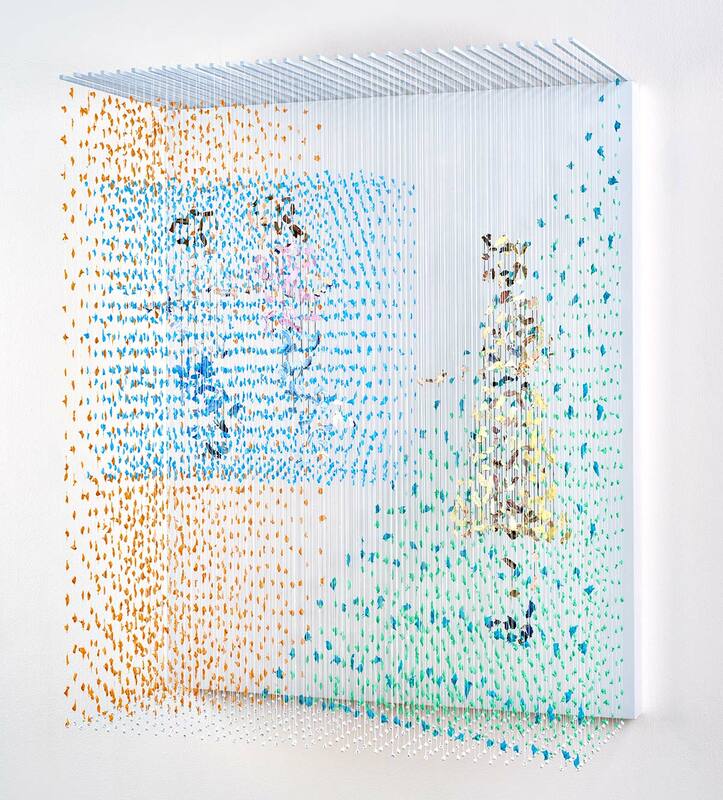 After mapping his scale figures onto the strings that served as a three-dimensional canvas, Dorosz ties beads onto those strings and applies layers of paint that form the human figures that fade in and out of view depending on the viewer's perspective. "The piece, to me, is about lightness and freedom," Dorosz says. "It's referencing the potential of holographic images, and it's doing that through the breakdown of positive and negative states. I see them as merging together."